Reference to historical events associated with Antarctica offers a novel, interesting and exciting platform for specific issues ranging from the extreme nature of the physical environment (climate or geology, for example) to the need for environmental protection (pollution or whaling, for example). A substantial summary of early Antarctic history is provided by Harrowfield (1990). Ancient Greeks named southern continent Anti-Arkitos. James Cook (1772-1775) in the Resolution and the Adventure sailed to 71° 10S and aroused the interests of sealers and whalers on his return. Thadeus von Bellinghausen (1819-21) in the Vostok and the Mirnyi reached 69° 53 and sighted the Antarctic continent for the first time. Dumont dUrville (1837-1840) in the Astrolabe and the Zelee reached 66° S.
Charles Wilkes (1838-1842) led a small flotilla of the Vincennes and 5 other ships. James Clark Ross (1840-1843) led the first British Antarctic Expedition in the ships Erebus and Terror. They reached 78° 17S and discovered the Transantarctic Mountains, the Ross Sea, the Ross Ice Shelf, Victoria Land, Ross Island, and Mts. Erebus and Terror. Henryk Bull (1895) managed a whaling expedition south in the Antarctica and landed on the continent. Carsten Borchgrevink claimed to be the first, although this was disputed by a 17 year old, Alexander von Tunzelman, who claimed he leapt out to hold the boat steady. Adrien de Gerlache (1897-1889) sailed south in the Belgica and over-wintered in 1898 when they became trapped in the pack ice in the Bellinghausen Sea. This expedition is also noteworthy because among the crew was the young Amundsen making his first trip south. Carsten Borchgrevink (1898-1900) returned to Antarctica in the Southern Cross. They over-wintered through 1899 at Cape Adare. The zoologist Nicolai Hansen died on 14 October 1899 becoming the first person to be buried on the Antarctic continent. During their stay they sledged to 78° 50S, setting a new southerly record. Robert Falcon Scott (1901-1904) made his first of two trips south in the Discovery. The ships was frozen in at Winter Quarters Bay (Ross Island) in 1902 and they built a hut nearby (adjacent to the current McMurdo Station). Able Seaman George Vince lost his life on 11 March 1902 when returning across the island with others from Cape Crozier. Scott, Edward Wilson and Ernest Shackleton reached 82° 17S on 30 Dec 1903. A party led by Armitage reached the polar plateau for the first time and on their return discovered the Taylor Valley, one of the Dry Valleys. The relief ship the Morning arrived in January 1903 under Captain Colbeck and left with Shackleton (who suffered from scurvy on the push south) and a number of others. The rest stayed behind to overwinter another season. In January 1904 the Morning returned with the Terra Nova under Captain Mackay, the Discovery was freed using explosives, and the ships left for New Zealand. 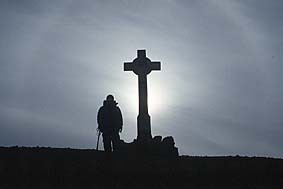 The cross erected on Hut Point (Ross Island) in memory of George Vince. Ernest Shackleton (1908-1909) returned in the Nimrod which was towed to the pack ice by the Koonya to save coal. His group built a hut at Cape Royds on Ross island. A party of six led by T. W. Edgeworth David climbed Mt. Erebus in March 1908. 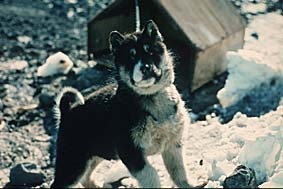 One (Brocklehurst) had severely frost-bitten feet and had to be left behind at an overnight staging point. The round trip from Cape Royds took 6 days. Shackleton, Jameson Adams, Eric Marshall and Frank Wild got to 88° 23S (148 km from the pole) on 9 January 1909, discovering the route up the Beardmore Glacier to the Polar Plateau later used by Scott. Edgeworth David, Douglas Mawson and Forbes Mackay reached the South Magnetic Pole on 16 January 1909. Roald Amundsen (1910-1911) sailed south in the Fram. He ascended the Axel Heiberg glacier with Hanssen, Wisting, Hassel and Bjaaland and reached the South Pole (90° S) on 14 December 1911. Robert Scott (1910-1913) returned in the Terra Nova and built their expedition hut at Cape Evans. Edward Wilson, Henry Bowers and Apsley Cherry-Garrard undertook "the worst journey in the world" to Cape Crozier in the middle of winter. Scott, Wilson, Bowers, Lawrence Oates and Edgar Evans reached the South Pole on 17 January 1912 (about a month after Amundsen) only to perish on the return journey. Victor Campbell and other members of the northern party were forced to overwinter in an ice cave on Inexpressible Island in Terra Nova Bay. The Terra Nova returned on 18 January 1913. Scott's hut at Cape Evans. Douglas Mawson (1911-1914) led the Australian Antarctic Expedition sailing south in the Aurora. This expedition is memorable for Mawsons epic sledging journey in which his companions Belgrade Ninnis and Xavier Mertz lost their lives. Ernest Shackleton (1915-1917), having been beaten to the pole, planned a third expedition (the Imperial Trans-Antarctic Expedition) using two ships. The Aurora carried a group to lay depots to the bottom of the Beardmore Glacier, while the Endurance was to deposit the crossing party on the other side of the continent. However, the Endurance became trapped in the ice and sank in November 1915 and the crew of 28 took to the boats reaching the comparative safety of Elephant Island. From here, Shackleton and five others sailed the James Caird 1300 km to South Georgia and ultimately organised the rescue of the rest of the crew. Meanwhile, the Aurora was taken out to sea in a blizzard and obliged to return to New Zealand leaving a party of 10 under A. L. A. Mackintosh stranded on Ross Island. This group laid the planned depots the following austral summer, but on the return journey the Reverend A. P. Spencer-Smith died. Two others (Mackintosh and Hayward) also perished when they attempted to cross the sea ice from Hut Point to Cape Evans. The survivors were ultimately rescued by the return of the Aurora with Shackleton on board. The Ross Dependency was established and administered by the Governor General of New Zealand on 30 July 1923. Richard Evelyn Byrd (1929-1930 and 1933-1935). Sailed to Antarctica in the City of New York and established Little America in the Bay of Whales. In October 1956 an R-4D Dakota (Que Sera Sera) landed at the South Pole and the construction of a permanent base began. The International Geophysical Year (1957-58) increased scientific activities in Antarctica with over 5000 personnel being involved. The year paved the way for the Antarctic Treaty. 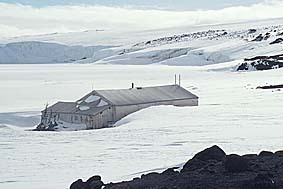 New Zealand established their Scott Base at Pram Point (3 km from McMurdo Station) in January 1957. Sir Vivian Fuchs, with Sir Edmund Hillary, led the Commonwealth Trans-Antarctic Expedition. Hillarys team became the first since Scott to reach the South Pole, while Fuchs team was the first to complete a trans-Antarctic crossing. The Scientific Committee on Antarctic Research (SCAR) was established in 1958. Write in support of establishing Antarctica as a World Heritage Park emphasising its unique features.